Work with the most talented team in the entertainment industry. that crafts unforgettable wedding events in the world’s most elegant venues. As a group of seasoned professionals, our team brings an unparalleled level of talent and personalized service to luxury weddings and entertainment. Years of experience have led to our esteemed reputation in today’s wedding world, and we are proud to have been involved in so many incredible events. From customized music, transformative lighting concepts, to state-of-the-art experiential equipment, DLE Event Group is always focused on raising the bar and surpassing expectations. The right entertainment company is an investment in your overall wedding experience. Even a carefully planned setlist can take your wedding from pleasant to epic, leaving guests raving about your reception for decades to come. Based on the principle that no two couples are the same, we tailor each event to reflect your distinct style and personality. Rather than overbooking weddings for volume and spreading ourselves too thin – DLE Event Group takes a boutique and hands-on wedding approach. We only work with selected couples to ensure the perfect collaboration. For over ten years, DLE Event Group has specialized in DJ, MC, Live Music, Sound and Lighting Production for Luxury Weddings and events in New York City and beyond. When it comes to talent, this diverse group is made up of “the best of the best,” and has a passion for entertainment, cutting-edge creativity, and designing awe-inspiring events. “Look no further. The search for YOUR perfect wedding entertainment experience ends here. Thanks to our incredible team and their unconditional dedication to our clients, DLE Event Group is honored to have been featured in The Knot for five years in a row (2013-2017). 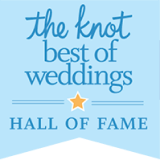 As recipients of the publication’s “Best of Weddings Hall of Fame” award, we are humbled by this exclusive acknowledgement – a true testament of our passion for what we do. Schedule a free 20-minute call with one of New York’s most distinguished wedding entertainment providers. These spots are extremely limited and will be awarded on a first-come, first serve basis. Schedule a free 20 minute call with one of New York’s most distinguished wedding entertainment providers.